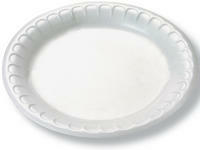 A durable Solo 9" Styro Foam Plate. High quality and value. This is the same plate that we use in our breakroom. We have found nothing better for the money. Perfect for lunches, picnics or general use.